Happy new year to you! May this year be one of growth and joy. I’m excited to announce that I am now offering private hypnobirthing classes in Bondi Junction and via Skype. Learn how to harness the natural processes of your body to experience the relaxed, connected, natural birth that you want. To find out more, visit my Hypnobirthing page, or get in contact to schedule your private class! I wrote a book for people like us. Did I tell you I have been writing a book? Well, at last, it’s done! It’s Better Than Done, actually. My co-author, Geffen Rothe and I are so excited to share this powerful book with you. We would be ecstatic for you to get your hands on a copy of the first paperback print run or the Kindle edition, both now available on Amazon for you..
We wrote Better Than Done together over the course of two years. It is a powerful example of collaboration between colleagues, ultimately rendering us as friends and business partners. It’s about a new, better way to set goals. Traditional goal setting is outdated, ineffective and unsatisfying. There is a better way – paying attention to the qualities that are most important to you, every day. 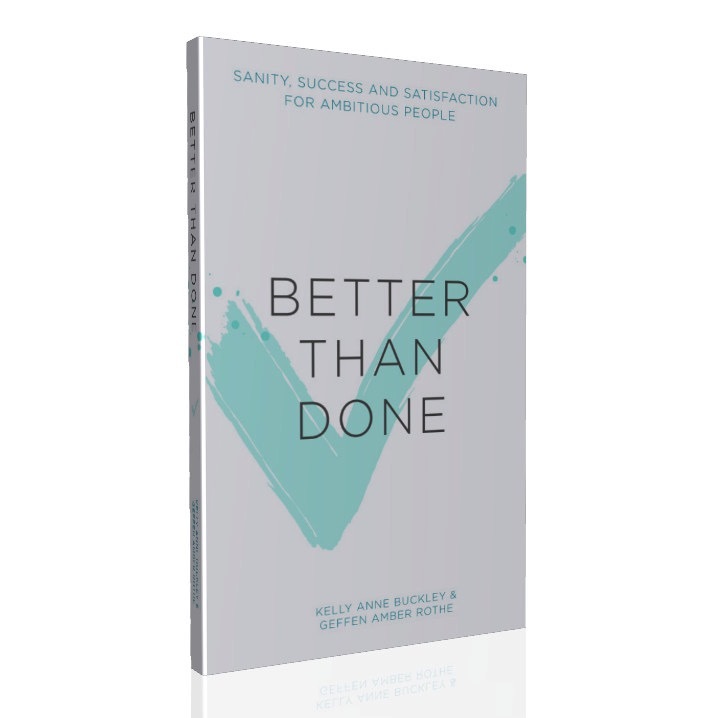 Better Than Done teaches you how to focus on your most valued qualities while living an ambitious life. We know this is so much more satisfying than just doing, doing, doing. Better Than Done is more than a how-to process to achieve meaningful goals. It is a completely new way to approach being ambitious, called Intentional Goal Setting. You’ve heard the phrase “It’s about the journey, not the destination” many times. Well, we wanted to create a guidebook for how to actually do this, without compromising that desire to achieve ambitious, concrete results. Be the first to get Better Than Done. Get ahead of the pack and enjoy being one of the very first people to get a copy of my book in your hands. Begin your own journey of setting ambitious goals with sanity, success and satisfaction. Here it is then. Better Than Done. It’s for you. It’s for your friends. It’s for your colleagues. It’s for your children. I am thrilled to share my book with you. Better Than Done: Sanity, Success and Satisfaction for Ambitious People is available internationally for purchase on Amazon. Click here to buy Better Than Done in your country. To your success and satisfaction! With another New Year upon us are you full of enthusiasm and good intentions for these next 12 months? The New Year is a naturally powerful time to pause and reflect on what you most desire in the coming 12 months. Sadly, a disheartening statistic quoted in the Journal of Clinical Psychology tells us that only 8% of people are successful at achieving their New Years Resolutions. If you’re among the 92% that do not achieve their resolutions you may be telling yourself that its because you’re not disciplined enough, not committed enough or not focused enough. The real truth is that the New Years Resolution system is broken. New Years Resolutions come from the S.M.A.R.T goal methodology developed in 1981, and that methodology is out of date. The S.M.A.R.T acronym stands for setting goals that are specific, measurable, actionable, realistic and time-bound and this approach has been the staple diet of business and management for the last 30 years. The reason you are failing in your New Years Resolution is that you are using out-dated technology. I have spent the last few years researching and experimenting with an improved approach to goal setting that ensures my clients, and myself, maintain enthusiasm and momentum while pursuing highly ambitious outcomes. This month I’m thrilled to be launching my first workshop introducing the Intentional Goal Setting System. The Intentional Goal Setting System flips the S.M.A.R.T goal setting system on its head. Instead of chasing a very 1980’s form of external material success, our new approach to setting goals, tracking progress and defining success is all about being satisfied while pursuing your deepest desires. The Intentional Goal Setting System invites you to focus on the kind of person you desire to be. Then, instead of focusing exclusively on your end result, you track the tangible, measurable experiences that provide proof that you are being who you want to be. This approach builds a greater sense of satisfaction in day-to-day life and provides you with strong motivation to keep on moving forward. If you’re ready to make 2015 your most satisfying and successful year yet, then I invite you to be among the first to join me for my Intentional Goal Setting Workshop debut on 10th January. Whatever your desires for the New Year, may your year be profoundly satisfying and full of joy! With the Silly Season now upon us are you juggling a jam-packed schedule full of office parties, Christmas drinks and mince pie madness? Here are 3 strategies to stay slim and sane amongst the frivolity of the festive season. As I’ve blogged about before, our values drive our decisions. They dictate where we spend our time, energy and money. We feel best about ourselves and our lives when we live in alignment with our values. If you’re reading this, it’s likely that feeling healthy and good in your body is an important value to you. If you find yourself feeling tempted to subjugate your value of health in order to fit in with the crowd at this time of year, I invite you to take a moment to reflect. Get curious about how you can still be social and festive while living in alignment with your values. The next time the voice of temptation (posing as a rowdy colleague) urges you to have another drink, take a moment to check whether that decision is in alignment with your broader vision for yourself. Ask yourself whether accepting another drink will support your deeper desire to feel vibrant and confident in your body, and then make a decision to honour your values. As detailed in an earlier post, beliefs colour our view of the world and create the boundary conditions of our thinking. Beliefs like “I’ll look like a party pooper if I don’t join in the eating and drinking” or “people will think I’m unsociable if I abstain” limit our ability to think creatively about socialising. I invite you to examine your current beliefs about what it means to be sociable. In order to begin challenging those beliefs, I encourage you to put yourself in your fellow guest’s shoes. Ask yourself which of these two scenarios would be more enjoyable for you at a social event? Its likely that how another person makes you feel in their company is far more influential than the number of calories they consume. By delving deeper into beliefs about what really constitutes being sociable we begin to open up alternative ways of socialising that honour what’s most important to us. This time of year is steeped in tradition and ritual, and the serving of rich foods is one such tradition that can be challenging. Traditions and rituals create strong unconscious associations that evoke memories of good feelings. When food is involved in tradition and ritual we anchor those positive feelings to foods. If you often find yourself over indulging in particular festive foods, ask yourself what feelings you’re really craving. Is it comfort, warmth or the cozy memories of preparing a special dish with a loved one from your childhood? Amongst the busy-ness of December I encourage you to take a moment to get in touch with your values. When you take the time to consciously honour your values over the holiday season you will find yourself well ahead when the New Year arrives. Then, instead of spending January making up for poor decisions made in December, you’ll be ready to step into the New Year, right on track and ready for an amazing year ahead of you. Hypnotherapy is just wonderful for clearing the blocks, the negative habits and self-defeating beliefs that can make it hard to get through the day. Once we’ve tackled those barriers and reclaimed some mental space, then the real fun begins! The answer to my client’s questions is to use that liberated energy to begin to create your life consciously. Until now, you may have found yourself living a life that was created by default or as a result of external circumstances. With the biggest energy drains and negative components now under control, you are in the privileged position to identify your dreams and desires and begin bringing them to fruition. This is where my coaching skill-set comes into play. Coaching is forward-looking and action-oriented. In coaching with me, you have the added reassurance of my arsenal of hypnotic tools and techniques that can be called upon, as needed, to turbo-charge your progress. Therefore, I am delighted to announce the launch of my personalised 3-month coaching program for hypnotherapy graduates. The coaching program is specifically designed to support you – from discovering your desires and setting clear goals, to taking joyful action, all the way through to celebrating your successes. The program supports you with nine 45-minute coaching sessions across the 3-month period to keep enthusiasm and motivation strong. You can read more about my coaching offering on my website, where I answer some of the questions that you may have. Alternatively, if this program tickles a glimmer of excitement inside of you, then get in touch and let’s talk. I’m offering a complimentary 30-minute consultation to answer any questions you may have and to explore how my coaching program could help you take your next joyful step in life. To make most efficient use of time, the coaching program is offered via telephone (or Skype, Facetime, Google Hangout). By working the program remotely, you will find it simple to fit our calls into your busy week. A 45-minute call allows you to speak during lunch breaks at work or to find space in your schedule between your business appointments. Face to face coaching in my London offices is also available upon request. The program cost is £195 per month for 3-months. Should you wish to purchase the entire program upfront, I offer a full payment price of £550. In order to deliver exquisite service to my coaching clients, I only have room for 5 coaching clients for this launch. So if you’re ready to get started designing a life that you love, get in touch today for a complimentary 30-minute consultation to get you on the path to living a life that gives you joy. Today, October 10th, is world mental health day – a day designed to raise awareness of the mental health issues faced by people across the globe. In 2013 15.2 million working days were lost due to the mental health problems of stress, anxiety and depression in the UK1. Mental health problems were the third biggest contributor to absenteeism after back and neck problems and coughs and colds. Given that the management of stress and anxiety plays a key role in a happy and productive workforce, we need to get serious about solving these health challenges. Historically, anxiety has been regarded as a purely mental problem. The associated physical symptoms have been seen as a result of mental processes such worrying and irrational thinking. Little attention has been paid to the physical processes that contribute to the condition. In our upcoming pioneering workshop next Sunday, 19th October, we combine my work as a clinical hypnotherapist with the work of Somatic Movement Educator Tanya Fitzpatrick to manage anxiety from both the physical and the mental perspective. The cost of the workshop is £35. You can purchase tickets in advance by clicking the button below. To keep the group intimate, spaces are limited, therefore we encourage you to book in advance to guarantee your place. Has your body forgotten how to relax? Over the summer my fascination with the phenomenon of anxiety has led me to investigate additional approaches to handling the problem. In my enquiry I came across a compelling, albeit low tech, lecture by Dr. Leon Chaitow of the University of Westminster, London on the wide-ranging negative effects of incorrect breathing and the link between breathing and anxiety. This discovery had me seek to correct of my own breathing. To achieve correct breathing, it was clear I needed to release the chronic tension in my back, chest and diaphragm. My search led me to the amazing Tanya Fitzpatrick. Tanya is a certified Somatic Movement Educator, an advanced yoga teacher trainer, and a Body-Mind Centering Professional. Her speciality is helping her clients to retrain their brains to tell their muscles to relax correctly and to learn to move in an effortless fashion. Tanya explains that through habitual patterns of tension, muscles in the body learn how to remain tight, and the brain develops what she terms sensory motor amnesia. This means the brain literally forgets how to relax these muscles at all, leading to chronic tension, pain and restricted breathing. Tanya and I quickly realised what a beautiful synergy our work has. She helps clients release physical patterns of anxiety and I help clients release the mental patterns that hold anxiety in place. Imagine the power of experiencing the effect of both! We are so excited to share with you our brand new workshop, Reprogramming Anxiety, which will be held on Sunday 19th October at 10am at Clerkenwellbeing, 178 Goswell Rd, EC1V 7DT. I often work with highly competent professionals who want to rid themselves of the fear and panic involved in public speaking. What usually brings them to see me is a building feeling of anxiety about an upcoming presentation with all the associated physical symptoms of sweaty palms, tight throat, pounding heart and fast breathing. Hypnotic intervention for panic responses experienced during presenting is very effective. When I’m not in the therapy room, I spend my time learning and performing trapeze. I know the incredible power of a natural shot of adrenaline before a performance. That anticipatory load of chemicals makes me strong, strong enough to perform moves that I sometimes struggle to complete in rehearsal. These chemicals also slow time right down, which allows me to have the luxury of ensuring my hand is positioned perfectly on the bar so I can execute my next move with confidence. This heightened state of consciousness experienced by performers is called Flow. The term was originally coined in the 1980’s by positive psychology researcher Mihaly Csikszentmihalyi when referring to an optimal state of performance. Flow is a state of focused or concentrated attention. In that state, time distorts – seconds stretching and slowing down during a performance or hours washing away in an eye blink as you’re completely immersed in a piece of work that you’re creating. A ten-year study conducted by McKinsey found that top executives in flow are 5 times more productive than out of flow. In the New York Times bestseller, The Rise of Superman, author Steven Kolter explains that in the flow state the brain’s prefrontal cortex is shut down. The prefrontal cortex is the part of the brain that houses the inner critic. When that critical voice is silenced we are no longer self-conscious or self-critical, and we are free to create and to perform. The first stage of the flow cycle is known as struggle, which feels really unpleasant most of the time. Struggle gives way to release… and that triggers the actual flow state itself. The key message here for those seeking optimum performance – whether that is in the athletic, artistic, creative or intellectual arena, is to realise that those early tingles which in the past you may have labelled as nerves, anxiety or fear are actually the precursors to flow. Those tingles are telling you that if you stick with it, holding a clear belief and vision of a successful outcome, that you can step through the doorway into flow where you can “be swept up by the river of ultimate human performance”. So the next time you have the opportunity to take a risk by speaking up, I encourage you to recognise the opportunity that is available to you, the opportunity to step through the doorway and experience yourself in flow. In her TED talk, How to make Hard Choices, philosopher Ruth Chang shares a new way of handling choices between two difficult options. “What makes a choice hard is the way the alternatives relate” she explains. “In a hard choice, one alternative is better in some ways, the other is better in other ways and neither of them is better than the other overall”. Values are typically single abstract words like love, freedom, security, trust or joy. These words represent what’s important to us and will determine where we spend our time, our energy and our resources. I regularly use values in my work with clients. If you recall the Hierarchy of Change model that I wrote about in January, you’ll remember that changes made at the level of values and beliefs will automatically impact on your behaviours, your capabilities and your environment. Most often our values are unconscious and were installed in the formative years of early childhood. Values are installed unconsciously through the strong influences of our family, our education and our culture. Unless we bring those values to conscious awareness, we are destined to evaluate our hard choices based on someone else’s outdated programming. Once you uncover and claim your own values, you are then much better equipped to be able to make a decision when faced with a hard choice. Ruth Chang explains that hard choices occur when the options are “in the same league of value, while at the same time being very different in the kinds of values [they fulfill]”. For instance, if choosing between two career options, perhaps one as a graphic artist and the other as an investment banker, the graphic artist option fulfills the value of creativity and expression and the investment banking option fulfills the values of security and status. The key to making the hard choice is to know what values are most important to you. When we make these hard choices from our values we are setting ourselves up to enjoy the most satisfaction with the chosen option. So when faced with a hard choice between two options, I encourage you to follow Chang’s advice: “Instead of looking for reasons out there, we should be looking for reasons in here.” Make your decision based on your values, on what’s most important to you, to build a life rich in satisfaction.